Here you go. Cash or credit? And I specifically asked for brake line fittings. While helping my sister wrench on her T-bird, we found brake fluid leaking at the Brake Pressure Control Valves. I managed to locate a place that offers BPCV rebuild kits, but only for limited applications. After some e-mails and careful measurements, they discovered that they had the right parts to start offering a kit for this application too. Huzzah! But the battle wasn’t over yet. During disassembly, we discovered that there was enough rust to keep half of the flare nuts from turning independently of their lines. The result: twisted and broken brake lines. This left her with two options. Either find the other end of each broken line, and replace the whole piece, or cut the line a few inches away from the valve blocks and splice a new section into each old line. The car seemed to be more or less assembled around the brake lines, which were in otherwise good shape. So we decided to proceed with the second option. We picked a spot just a few inches away from the valve blocks, where the lines were straight and relatively easy to access. This is where the battery and its mounting tray sit. Just enough room to work a flaring tool. My sister cut the lines, and I fabbed up some replacement ends out of NiCopp. The old flare nuts were as good as new after drilling the old steel tubing out of the center of the nut, and cleaning up the threads a little. The guy at the counter nodded his head and directed us to follow him to the hardware aisle, where he soon produced this package. Dorman 785-302. Funny thing is, if they had stocked AGS fittings instead of Dorman ones, there would be a warning on the package that reads “NOT for use in Automotive Brake Line Systems.” No such labeling here. Could these have worked? Maybe. Temporarily. A compression fitting would have held pressure up to a point. If one was to go gentle on the brakes, you might get away it for a little while. Maybe that’s why Scotty Kilmer likes these things. I was going to turn this post into a full rant on everything wrong with compression fittings, but I’m missing a critical piece of information. I’m not sure how much pressure these fittings can actually hold. Is it because there are too many variables with associated with installation? 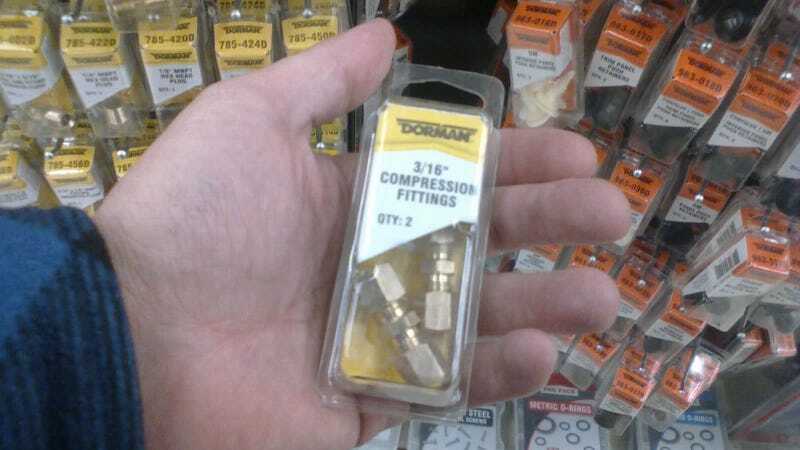 Dorman’s website does not provide a pressure rating for the 785-302. They simply say “not recommended for hydraulic brake systems”. A product Q&A from Advance Auto claims that “metal compression fittings may provide a reliable seal up over 200 psi to 220 psi”. Here’s a similar product from Fastenal, with an advertised working pressure of 1200 PSI. That’s right on the edge of possibly working for some cars, but there are plenty of cars out there that can generate several hundred more PSI. Could be handy for an emergency off-road repair, at least. And then here’s a high-pressure union that Dorman says is rated for 5000 PSI: the 800-202. That’s more that the working pressure on the lines themselves! There’s just one problem, though. We shouldn’t even be hemming and hawing over whether compression fittings will work, because they’re illegal to use on brake lines. At least they are in some areas, from what I’m hearing. I’m having trouble finding an actual law on the books, but a lot of people are saying that it’s an insta-fail if you take your car in for an inspection and they find even one compression fitting on the brake lines. We don’t have safety inspections on passenger cars here in Michigan, but if these things are prohibited by federal law, then the point is moot. Maybe these things can be safe. Maybe they can’t. Maybe they’re illegal. Maybe they aren’t. But they certainly shouldn’t be the first thing that comes to mind when suggesting a method of brake line repair.